If you've been following my blog for some time, you'll know by now that I am a huge peppermint fan. I find that a lot of the common peppermint desserts are combined with chocolate. I will agree that yes, chocolate and peppermint are excellent together. But, when it comes in cake form, or even ice cream, I prefer it to be white or vanilla. So, I decided to create my own cake for the holiday. Of course, it had to a milk bar style cake, because they are way more fun to make. This cake was everything I had dreamed it would be, and more. It was just the right amount of peppermint, but not overpowering. 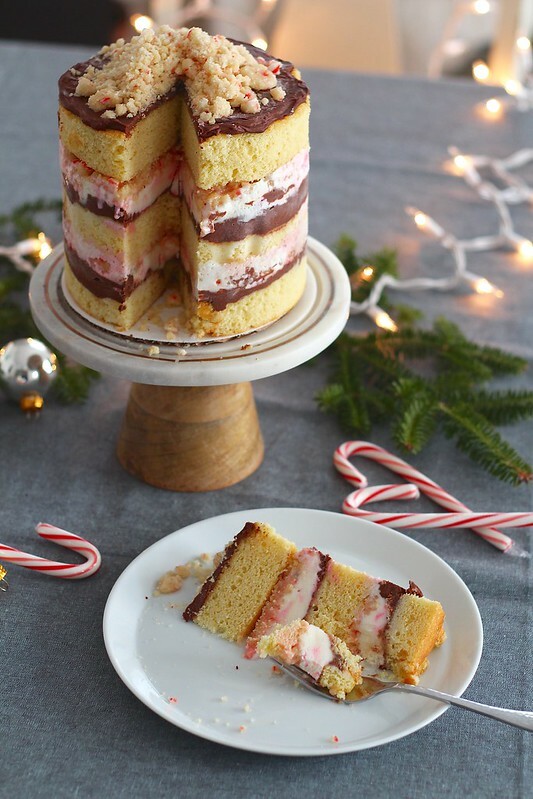 The combination of the yellow cake, chocolate ganache and peppermint ice cream are perfect. And, when you bake the peppermint cake crumble, it makes your house smell like a peppermint wonderland. It is amazing. Let me break this cake down for you, because there are a lot of components. 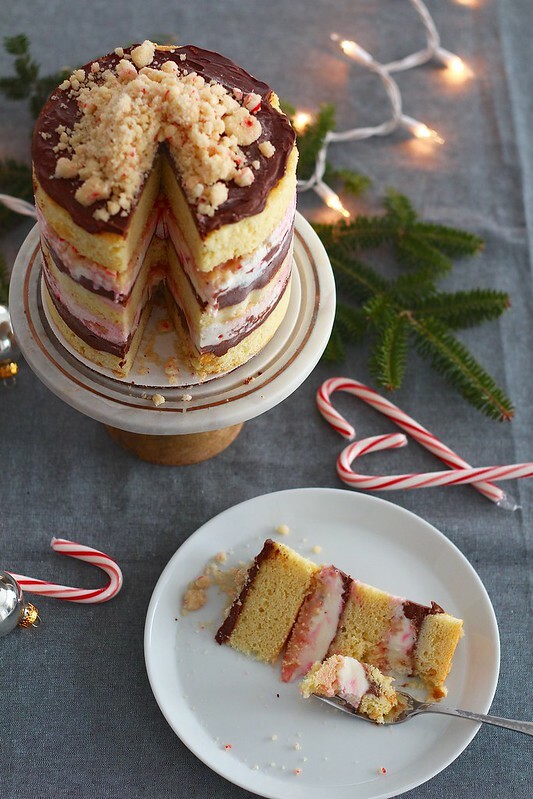 First, you have a simple white cake that is actually from the milk bar birthday cake, with a simple peppermint milk brushed over the cake. Then, a creamy ganache is spread over the cake. Homemade peppermint ice cream is slathered over the ganache. 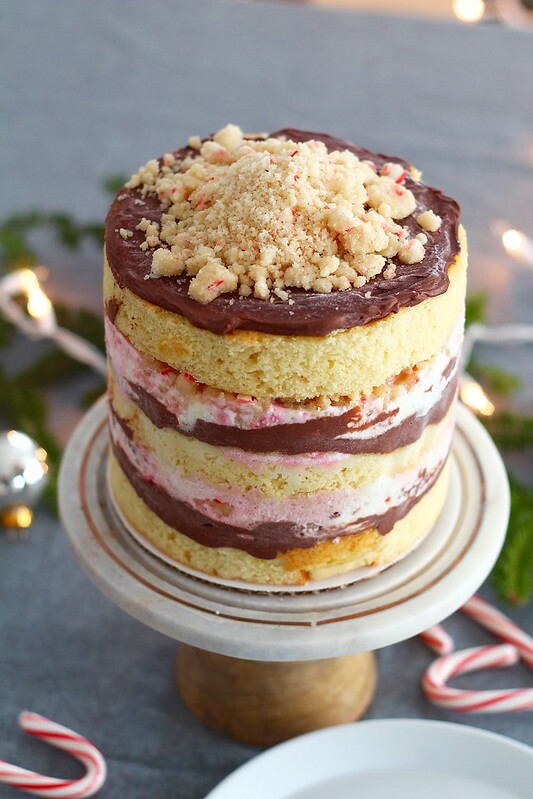 To finish the first layer, a peppermint cake crumble is sprinkled over the ice cream. The whole layering process is done once more. 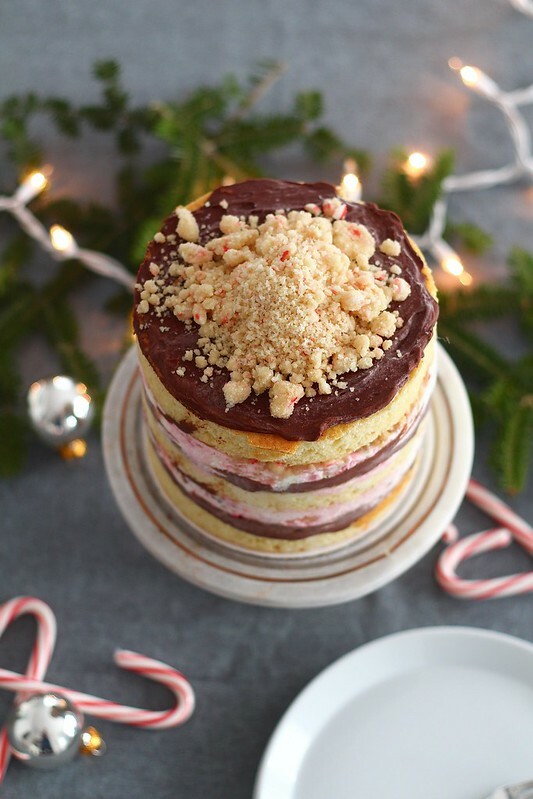 To finish, the last cake layer is slathered with the remaining ganache and garnished with peppermint cake crumbles. Holy smokes. Now that is what I call a cake! 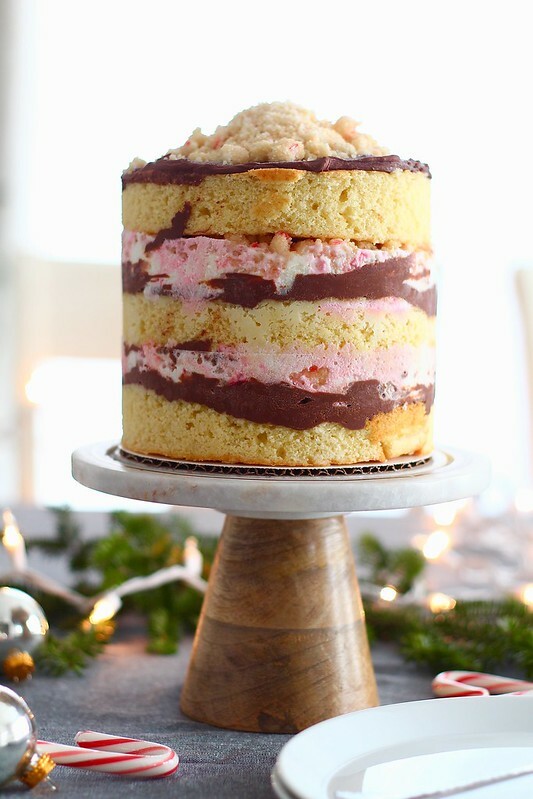 This would make the perfect holiday cake for a party, special dinner, or just any day of the week. This is so worth the time. And, it will last in the freezer for weeks! Take the time out of your day to make this, because you won't be disappointed. Besides, it's Christmas! Eat and be merry. To make the crumble, heat the oven to 300ºF. Line a baking sheet with a silicone baking mat or parchment paper. In the bowl of an electric mixer, combine the sugar, flour, baking powder, and salt. Mix on low speed until combined. Add in the oil, vanilla extract, peppermint extract, and crushed candy canes and mix until the dry ingredients start to form small clusters. Spread the clusters on the prepared baking sheet. Baking for 20 minutes, breaking them up occasionally. Remove from the oven. The crumbs will dry and harden as they cool. Cool completely before using. With the mixer on low speed, stream in the buttermilk, oil and vanilla. Increase the speed to medium-high and mix for 4-6 minutes, until the mixture is nearly white and twice the size of the original batter, and completely homogenous (there should be no streaks of fat or liquid.) Scrape down the sides of the bowl. With the mixer on very low speed, add in the cake flour, baking powder, and salt. Mix for 45-60 seconds, just until the batter comes together. Spread the batter in the prepared quarter sheet pan. In a large bowl mix the cream cheese and salt together until smooth. Don't make the ganache until you are ready to assemble the cake. To make the ganache, place the chopped chocolate in a small bowl. Heat the heavy cream in a small sauce pan over medium heat until the sides are bubbling. Pour the hot cream over the chocolate and let sit for 2 minutes. Whisk until smooth and the chocolate has melted, then whisk in the butter until incorporated. To assemble the cake, invert the cake from the sheet pan onto a work surface. Use a 6-inch cake ring to cut out 2 circles from the cake (these will be the top two layers.) Wipe off the cake ring and place it in the center of a sheet pan lined with clean parchment or a silpat. Use a strip of acetate to line the inside of the cake ring. Use scraps from the leftover cake to place in the ring and push together in a flat, even layer. Whisk together the milk and peppermint extract for the soak. Use a pastry brush to soak the cake with about half of the liquid mixture. Spread a third of the ganache in an even layer over the cake. Spread about 1 1/2 cups of the peppermint ice cream over the ganache, then sprinkle one third of the cake crumbs evenly over the top of the ice cream. Press down gently to anchor in place. Gently tuck a second strip of acetate between the cake ring and the top 1/4-inch of the first strip of acetate. Set a cake round on top of the frosting, and repeat the layering process once more (brush with soak, ganache, ice cream, cake crumbs.) Place the remaining cake layer on top of the cake crumbs. Cover the top with the remaining third of the ganache and garnish with the remaining cake crumbs. Transfer the assembled cake to the freezer and freeze for a minimum of 12 hours to set the cake and the ice cream. When you are ready to serve, remove the pan from the freezer, pop the cake out of the cake ring, and peel away the acetate layers. Transfer to a cake platter. Serve immediately, or store, well covered, in the freezer for several weeks.